Thaddeus Hogarth is an associate professor of guitar at Berklee College of Music, where he has trained hundreds of guitarists in the art of funk/r&b. He is an active performer and recording artist. "When I was a young blood, starting out in the Apollo Theater house band, the knowledge the old timers shared with me was invaluable. As I started working through the lessons in this book, it felt like an extension of those glorious soulstersguiding me like Lewis and Clark, down the trail to Funkland. This will be a priceless tool for the novice, as well as the pro of other disciplines. Bravo." 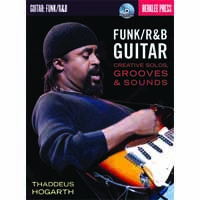 "Thaddeus Hogarth has articulated some of the 'secrets of the funk' in an easy to understand, practical manner. It is the only book I've ever seen that approaches funk and r&b with due respect, in its simplicities and complexities. He not only gives great examples but also takes you into the exploratory harmonic possibilities to find your own voice. If you're looking for "That Book" to unlock the inner workings of the groove and what to do on top of it, this is the book to read." "A timeless staple of r&b guitar. The format is meticulously detailed, the recorded examples are first rate, and the listening list is a veritable treasure-chest map."